I can eat pretty much anything and I am also willing to try anything with the exception of bugs but other than that I have an adventurous palate. 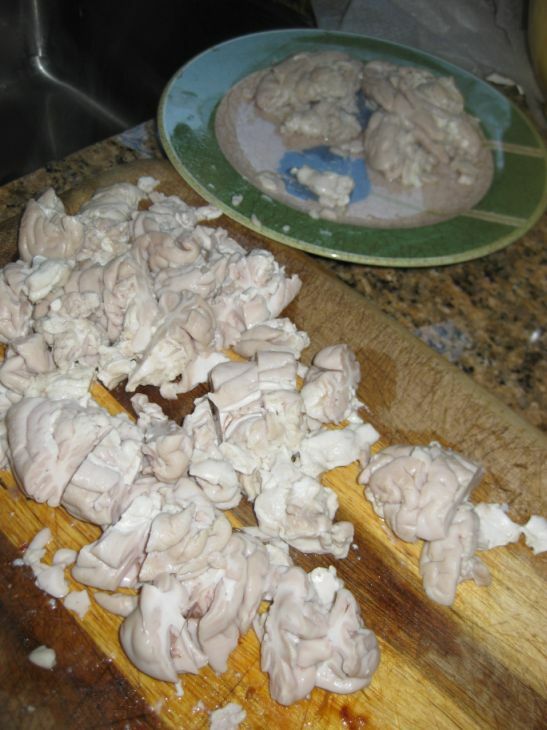 Brain sound gross and challenging to eat but once you get pass the idea of eating brain it is actually pretty good. 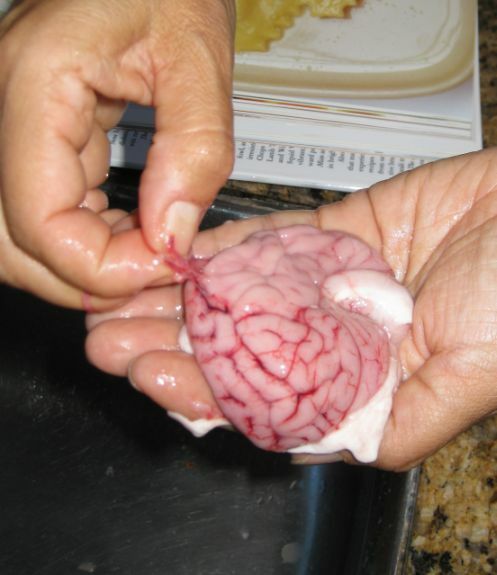 Brains are silky, creamy, and has a rich taste. 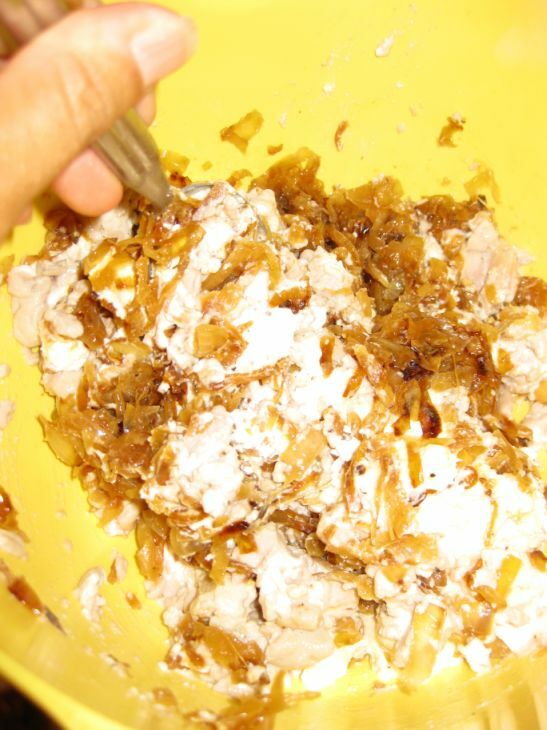 Here the brains are paired with ricotta and caramelized onion. 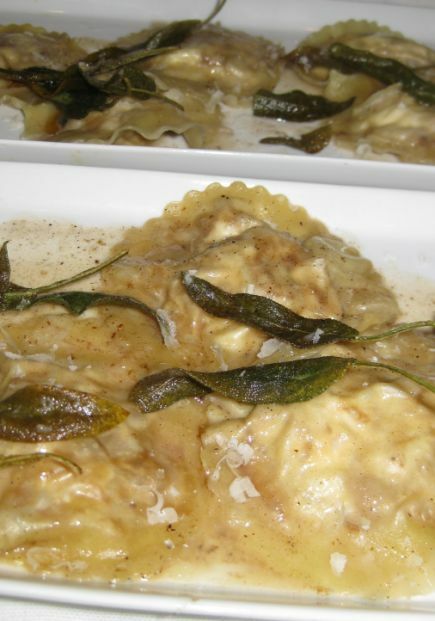 The caramelized onion add a sweet note to the ravioli. 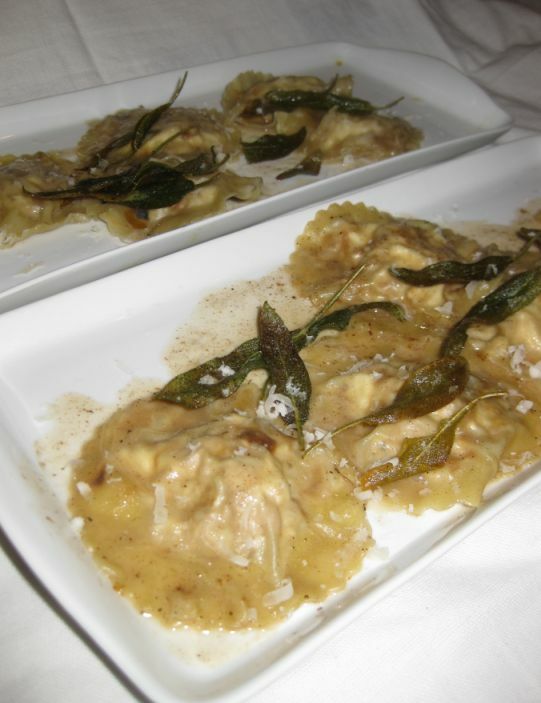 The ravioli is then sautéed in brown butter and served with crispy sage. 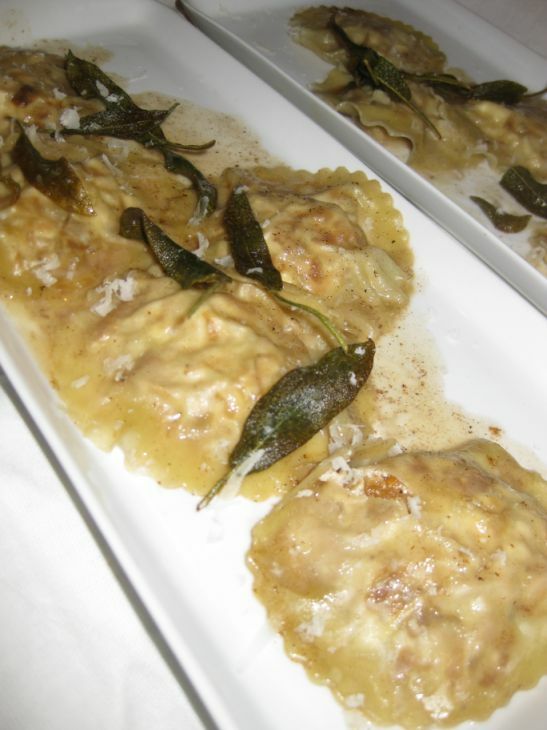 The ravioli tasted so good, they are soft, gooey and rich. Are you adventurous enough to give it a try? 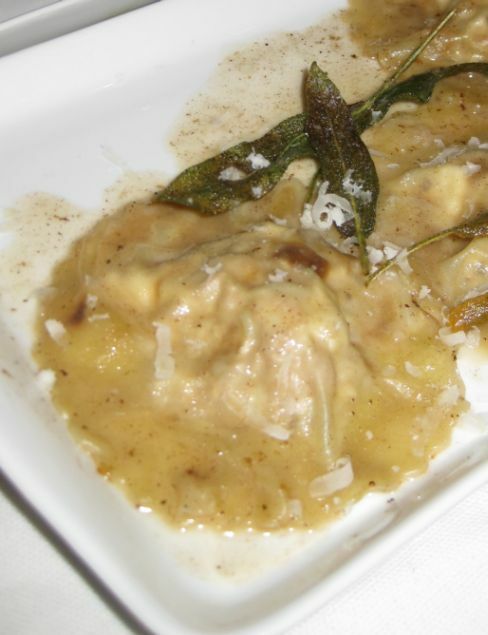 Close up look at the ravioli. 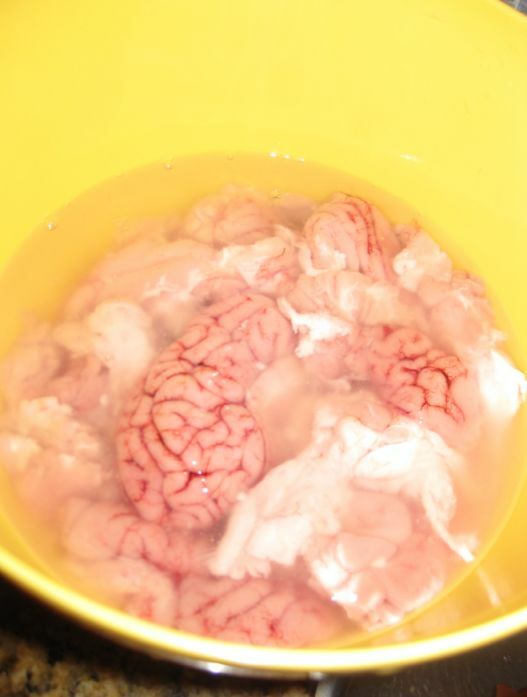 Soak the brains in cold water for about an hour or so. Remove the filament and soak it back in cold water. Meanwhile heat a large skillet on medium heat. 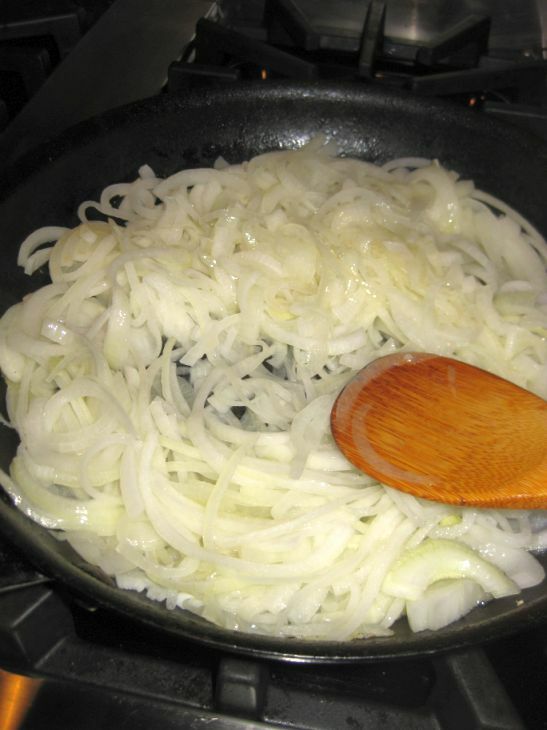 Add the oil and cook the onion slowly. Stir occasionally to avoid burning or sticking. 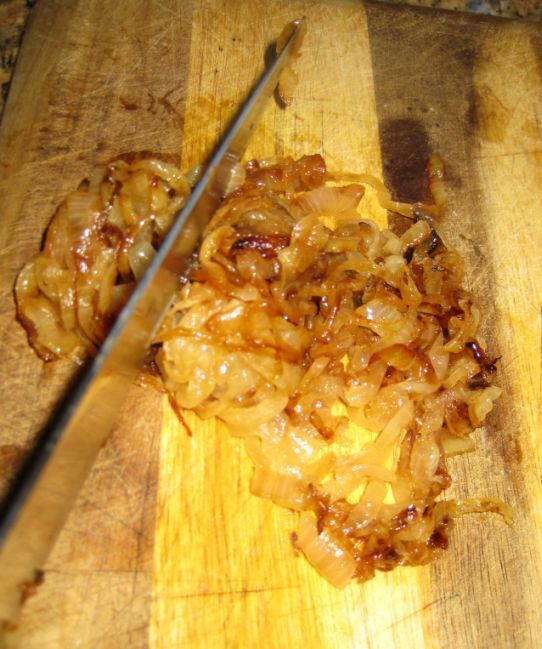 When the onion are caramelized (about 15 to 20 minutes) remove from the heat and set aside. 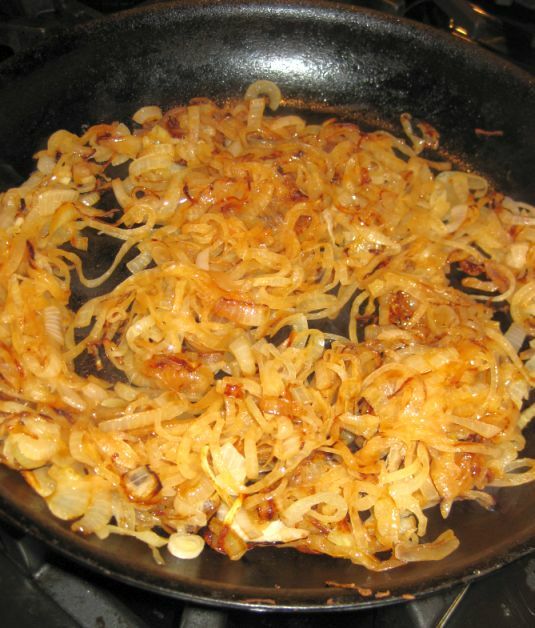 Chop the caramelized onions finely and set aside. 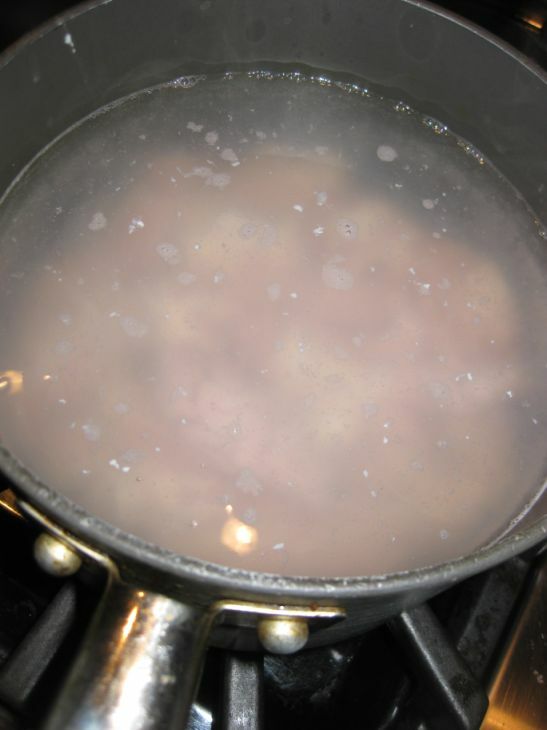 Fill a large pot with water, add 1 tablespoon of salt and bring it to a simmer. Add the brains. 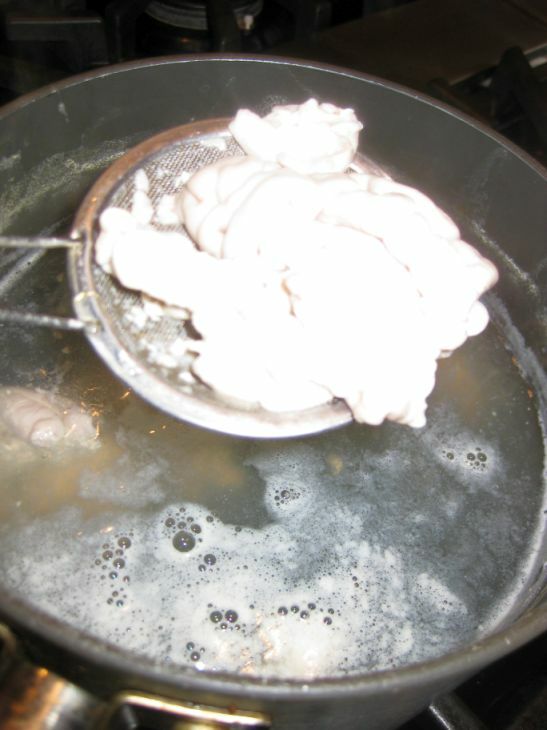 Poach the brains for about 15 minutes. Remove the scum coming on top of the pot. Remove the brain from the pot and let them cool down. 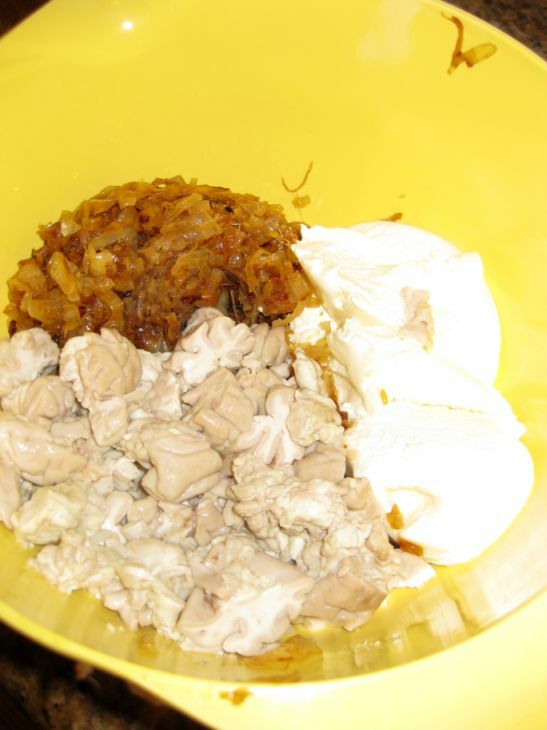 Put the brains, caramelized onion, and ricotta in a large bowl. 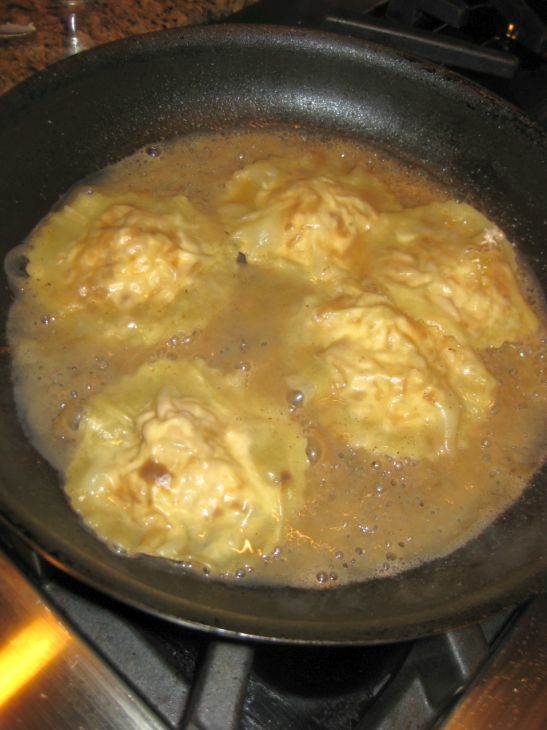 Spread out your wonton and place 1 rounded tablespoon of the brain filling. 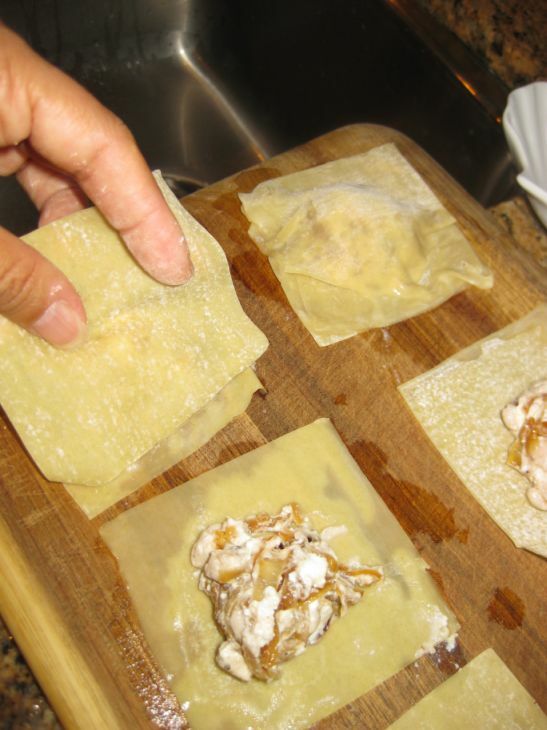 Wet the all the edges of the wonton and put another wonton wrapper on top. Press firmly around the edges to seal. 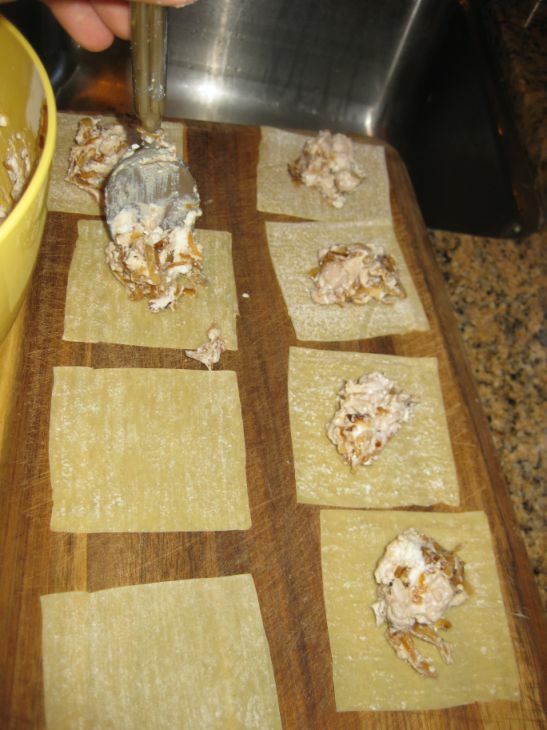 Continue with the remaining wonton wrappers. 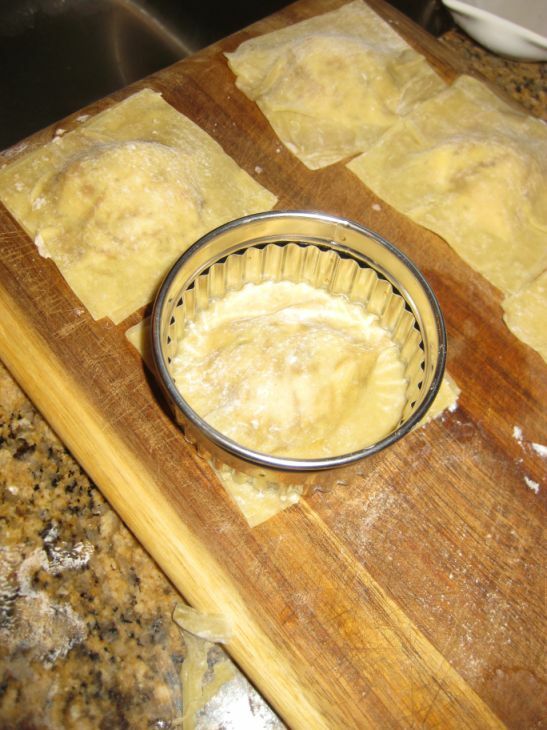 I am using a fluted cookie cutter to shape my ravioli but you definitely do not have to shape it and you can leave it in a square shape. 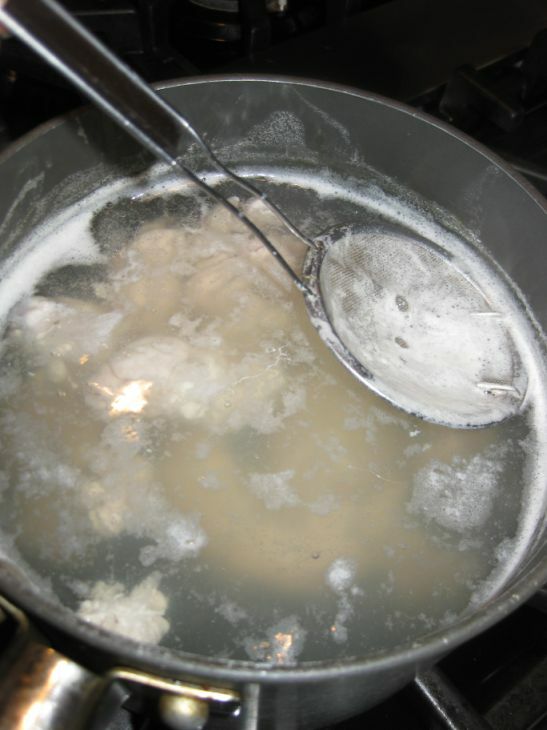 Bring a large pot of water into a boil, add 1 tablespoon of salt. 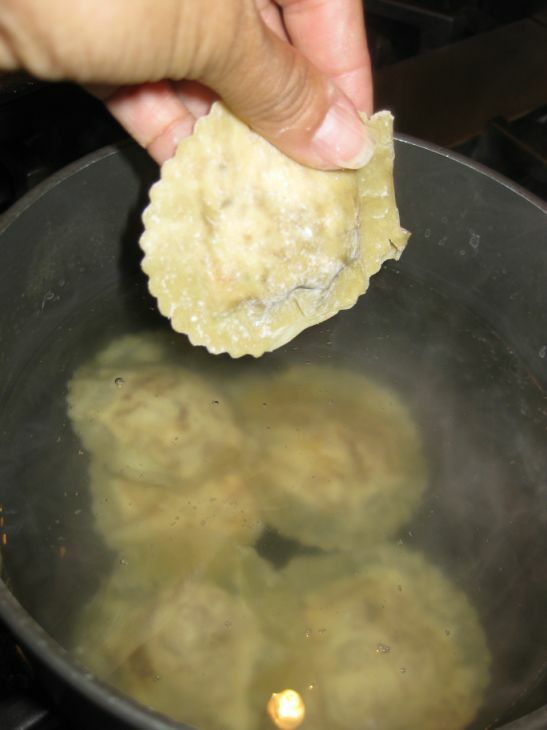 Gently drop the ravioli into the simmering water. 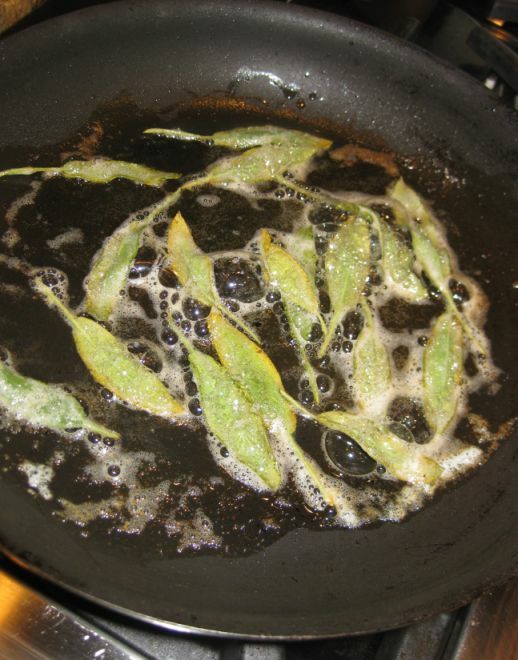 Melt the butter in skillet and when the butter is hot toss in the sage leaves. Let them crisp up a bit and remove from heat. Set the sage aside. 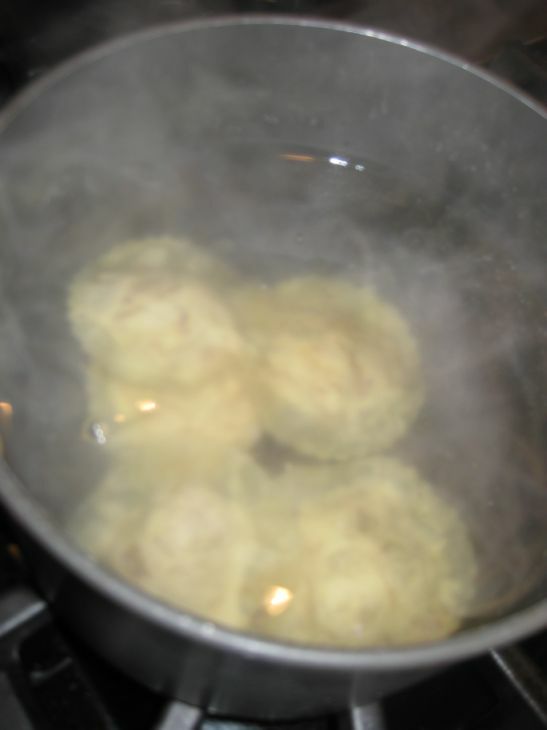 Using the same skillet, melt 2 tablespoons of butter, add about 1/4 cup of the pasta cooking water to the melted butter and shake the pan until the liquid are emulsified. Add the ravioli to the pan and toss over medium heat to coat, about a minute or so. 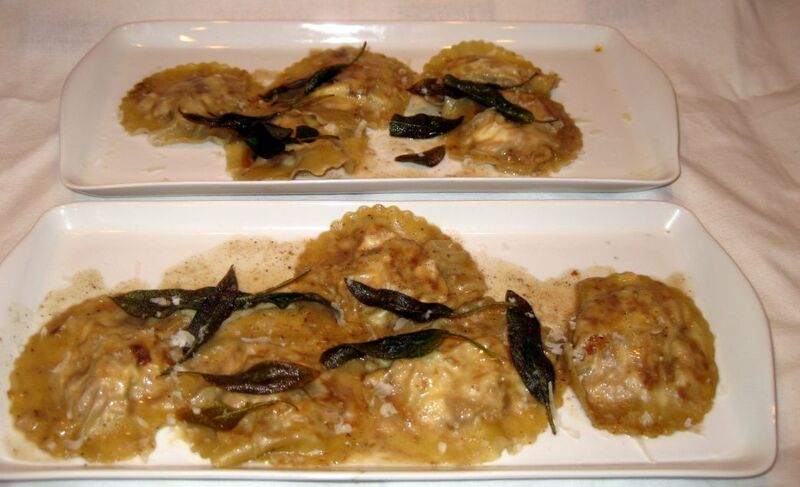 Remove from heat and divide the ravioli evenly among 4 warmed pasta bowls, grate some parmesan cheese and garnish with the crisp sage leaves.